The mineral blood test panel checks a variety of mineral blood levels. What is tested in the mineral blood test panel? This mineral panel measures your copper, ferritin, iron and TIBC, magnesium (serum), magnesium RBC, phosphorus, zinc (serum), and zinc RBC blood levels. Why is this mineral blood test panel important? This mineral lab panel helps identify important mineral deficiencies or toxicities. This Mineral Blood Test Panel is a blood test. The mineral blood test panel, also known as a mineral lab test panel, measures important mineral blood levels. This mineral lab test panel includes the copper blood test, ferritin test, iron and TIBC test, magnesium RBC test, magnesium test, phosphorus test, zinc RBC test and zinc test. Minerals are chemical compounds with unique properties and chemical structures. From a nutritional perspective, minerals are essential for many biological reactions essential for survival. Humans primarily get necessary nutrients from water and the foods we eat. Mineral supplementation can also occur through ingesting supplements. Biologically, minerals are sometimes categorized as trace elements and as major minerals. Because of their vital role in the body, mineral deficiencies and toxicities can both cause a variety of symptoms - some of which can be life-threatening. The specific symptoms associated with a mineral toxicity or deficiency depend on the mineral that is imbalanced. Mineral blood testing can help screen for important mineral deficiencies and toxicities. To get a mineral blood test panel near you, order online and get your blood drawn at the lab that you selected. Once your mineral panel lab results are ready, they will be available for download. 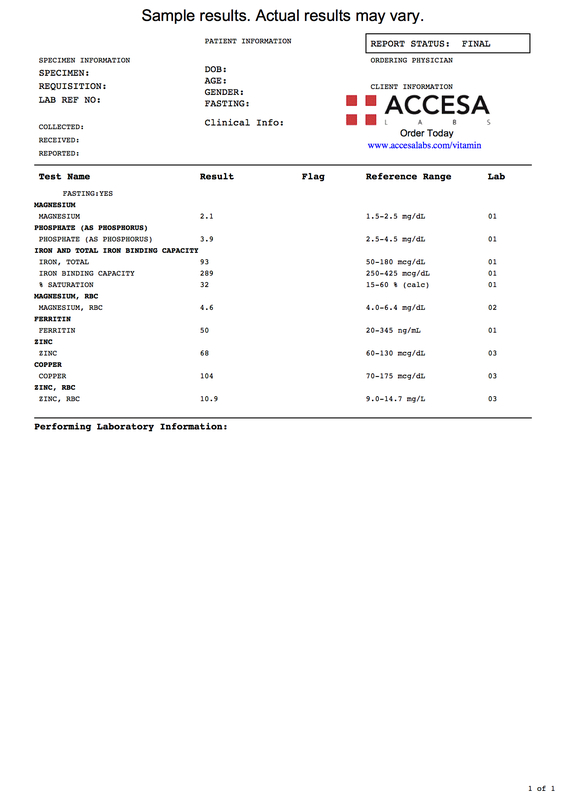 As can be seen on the sample mineral lab report above, the individual mineral lab tests performed in this mineral blood test panel are reported as numerical values and can be compared against the reference ranges provided by the lab. Mineral Blood Test Panel at Guaranteed Prices.